Home » Formula One: Hamilton edges Rosberg in American Friday practice! 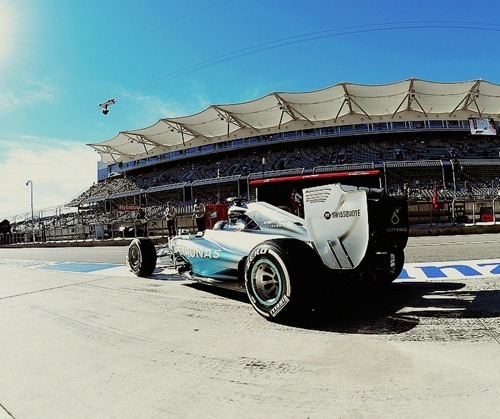 Lewis Hamilton topped both Friday practice sessions in preparation for this weekend’s United States Grand Prix. Nico Rosberg finished second in both sessions; missing out by just 3 thousandths of a second. Only 18 drivers took part in the session due to the absence of Marussia and Caterham due to financial issues. Hamilton was fastest straight out of the box as the first 90 minute Texan session got under-way at the Circuit of the Americas. He was just under 3 tenths ahead of Nico Rosberg, who is currently 17 points down on Hamilton with just 3 races to go in the championship. Jenson Button was 3rd fastest ahead of his team-mate Kevin Magnussen in 5th. The Dane had led the standings early on in the session as he waits to see if he will be retained by McLaren next season, or whether he’ll be replaced by Fernando Alonso. Daniil Kvyat impressively separated the two McLaren’s in 4th – his contract at Red Bull already in the bag for next year. Outgoing Ferrari driver Fernando Alonso was 6th fastest ahead of supposed incoming driver Sebastian Vettel, the pair just 4 tenths apart over the course of the 100 second lap. Felipe Nasr was in Valtteri Bottas’ car for the first session and managed to put the car 8th fastest. The Brazilian had previously driven the Williams in practice at Bahrain this season, but this time he was 3 tenths clear of similarly named Felipe Massa who was down in 11th place. Nico Hulkenberg was 9th fastest for Force India ahead of the second guest driver for the session as teenager Max Verstappen made his second F1 practice appearance in preparation for his record breaking debut for Toro Rosso next season. Kimi Raikkonen and Pastor Maldonado were 12th and 13th ahead of Adrian Sutil and the two Mexicans Perez and Gutierrez. Ricciardo and Grosjean completed the time-sheets in 17th and 18th. Ricciardo had suffered an ERS failure during the session and only completed 5 laps, whilst Grosjean trialled a single pronged front wing on his Lotus. Of course the time-sheets only go down to 18th due to the absence of both Caterham and Marussia this weekend. As a result of this, qualifying had been adjusted so that the 4 slowest cars will be eliminated in Q1 and Q2 instead of the usual 6. At the end of the session, a number of cars trialled out a new ‘virtual safety car’ procedure; a system bought in after the awful accident for Jules Bianchi in the Japanese Grand Prix. The drivers are all given a lap time on their steering wheels that they must run slower than so that safer speeds can be run without necessitating a safety car to disrupt the race. Hamilton topped P2 once again, but by much less of a margin than he had in P1. Only 3 thousandths separated him from Nico Rosberg in second place. Hamilton’s session ended prematurely after the team discovered a hydraulic issue at the rear of his car. Fernando Alonso took 3rd fastest for Ferrari, a position that he has finished in 10 times in practice sessions this year. Daniel Ricciardo recovered from his ERS issue in first practice to take 4th ahead of the improved Williams of Felipe Massa and the Ferrari of Kimi Raikkonen. Daniil Kvyat fell from his 4th place in FP1 to take 7th ahead of the two McLarens and Nico Hulkenberg’s Force India. The two Lotuses seemed to struggle on the Circuit of the Americas, with both Maldonado and Grosjean spinning throughout Friday. They still managed to finish ahead of the Sauber duo and Sebastian Vettel. The German confirmed between the two sessions that he would take a whole new engine, which would mean he would be likely to sit out quailfying and start from the pit-lane.